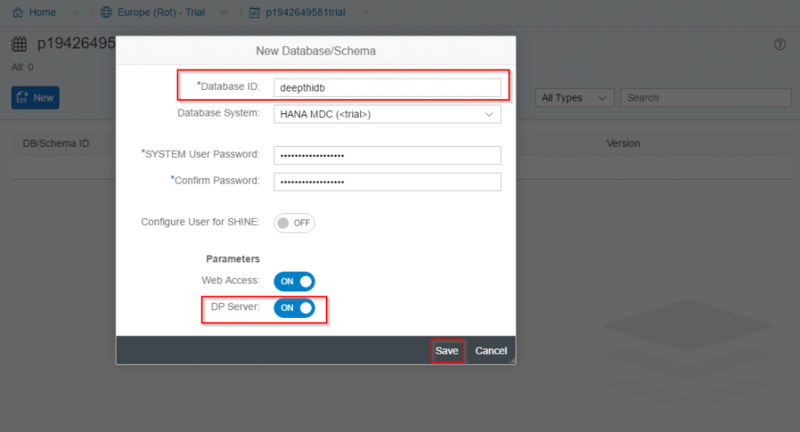 Steps to create database, tables in SAP HANA Cloud Platform (formerly HCP). 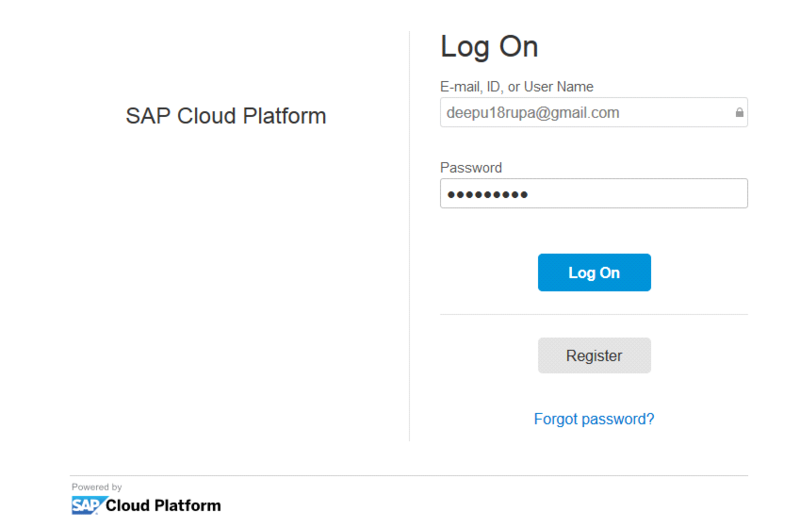 First of all you need an account in SAP Cloud Platform (SAP CP), for that follow the below steps. 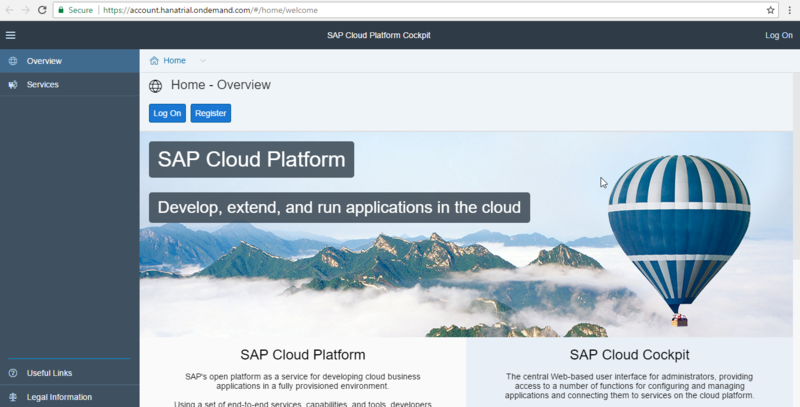 Go to Google and type SAP Hana Cloud Platform. 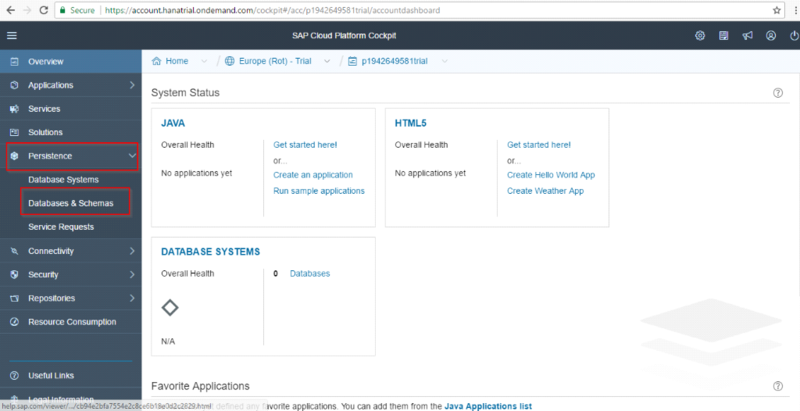 Click on HANA Trial- cloud. 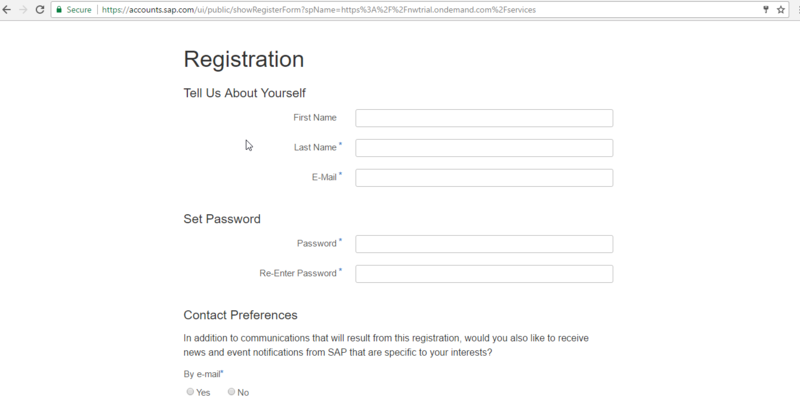 Click on Register.Then a page is opened like below. Enter your details over there and accept the terms and conditions by selecting the two options which are under “Terms&Conditions. Then you have got a screen like below. 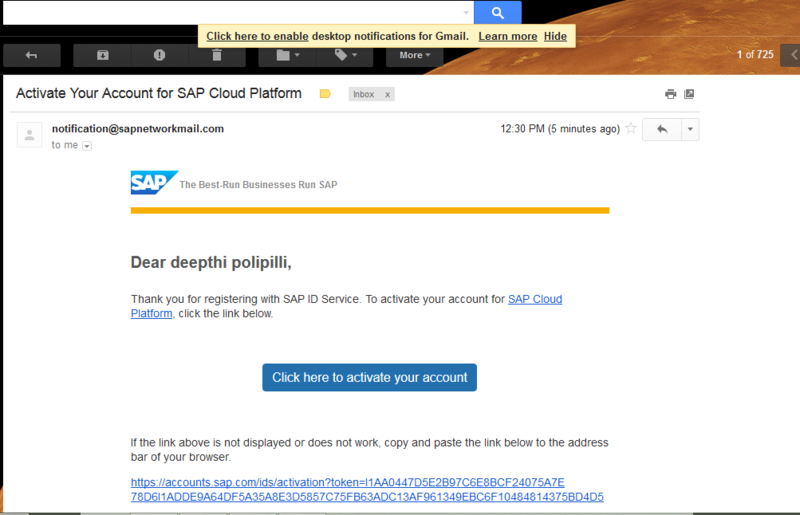 Then a link is generated and you have got a mail, consisting of that link from SAP. Click on the button “Click here to activate your account”. Then you have got a page like below and click on “continue”. You will get a “Logon” Page like below. 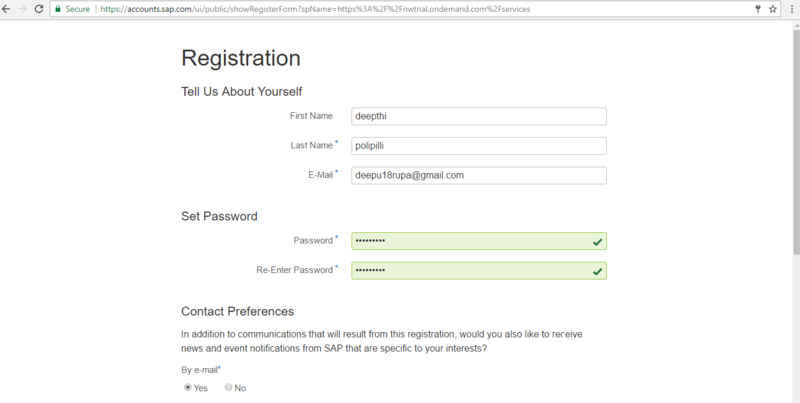 (Provide your logon details in the corresponding fields like username, password). and a window is opened like the below image.Click on “close”. After click on the “Close” button the webpage appears like below. In Overview–>Click on Persistance–>select “Databases&Schemas”. Click on Databases&Schemas. Then you found a window like below, which doesn’t contains any databases and schemas like “NO DATABASES OR SCHEMAS”. Click on “New” to create a “DATABASE”. Give a Database ID, SYSTEM User Password and select DP Server “ON” and click on “SAVE”. After click on “Save”, the database is created and you find that message in “Events”- consists of “Database ID”(Which you have given). Click on your “DBSchema ID”. There are three links available. 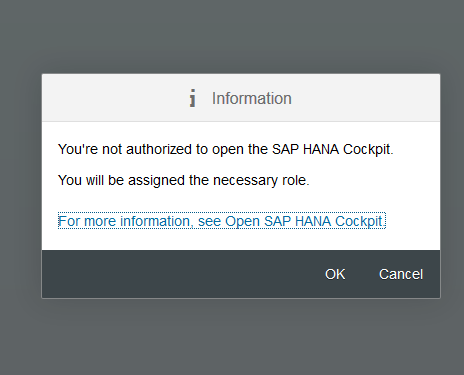 Click on Administration Tools- “SAP HANA Cockpit”. Then an alert message is shown. Click on ok–>Click on Continue. Then a webpage is opened as below, which consists of SAP HANA Database Administration. Go to your SAP CP Cockpit. Click on Development Tools : SAP HANA Web based Development Workbench. Provide your Username as “SYSTEM” and Password(Which is provided while creating your database) to Login to the Editor in Workbench. SAP HANA Web based Development Workbench is opened. Click on “Editor” or “Catalog”. 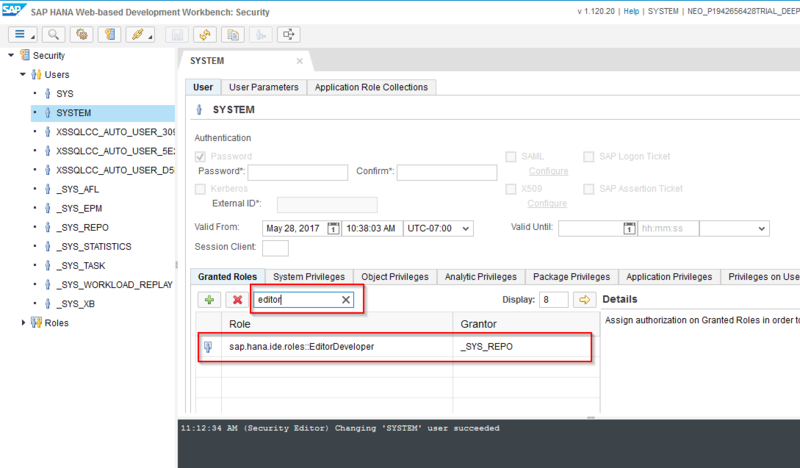 After creating a database instance on SAP HANA Cloud platform,while you are trying to access the “SAP HANA Web-based Development Workbench” link,you might be getting “403-Forbidden” error message. Let’s resolve the issue by going through the steps from the beginning. While facing an error like the above Click on “Security” in the workbench page and follow the steps as shown in the below screen. Following screen will appear and you would need to select “Users” from the left side panel. Then “Users” tab will be expanded, further you need to Click on “SYSTEM” as shown below, as a result role setting would appear. Further, you would need to click on “+” sign (green colored) as shown below. Then a screen appears like below. 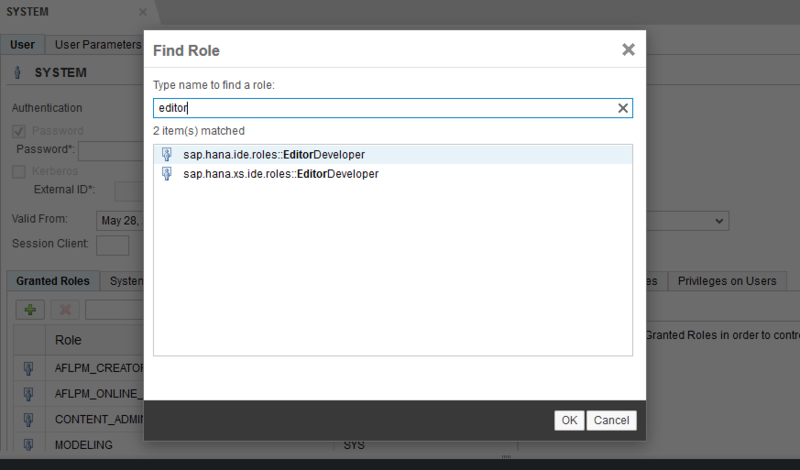 “Find Role” dialog box would appear, there you need to insert the phrase “sap.hana.ide.roles” to search and here we have to select “Editor”,”Catalog” .Then, press “OK” button to proceed further. As you could see, the new roles are assigned, but yet to be saved, that’s why “SYSTEM” tab is highlighted in yellow color indicating unsaved changes made. So, press the “Save” button or (Ctrl+s). 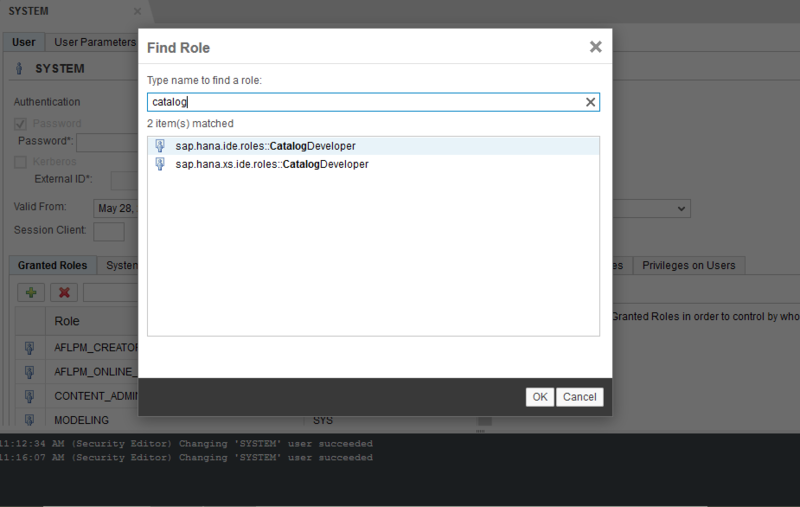 You might cross check whether it’s save correctly or not by searching the roles in “Granted Roles” as shown in the following image. That’s all we would need to do, while facing an error like “403 forbidden”,now you would be able to access “Editor” and “Catalog” tabs. Now go to your “SAP HANA WEB BASED DEVELOPMENT WORKBENCH.” and select Catalog. Then a page is opened like below. On left side Select Catalog and right click on Catalog, you will find a Schema Click on that and Enter your new Schema name. Then a new schema is created. In the following my Schema name is “firsttable”. Click on that Schema name and select “TABLES”. Right click on “Tables” and select “CONSOLE EDITOR”. Then a screen appears like below on the right side. On the “Console Editor” you can write the “Statements for table creation, insertion etc.,”. After creation of your table you can insert data into the table by providing an insertion statement in the console. You can find the result like below after selection. 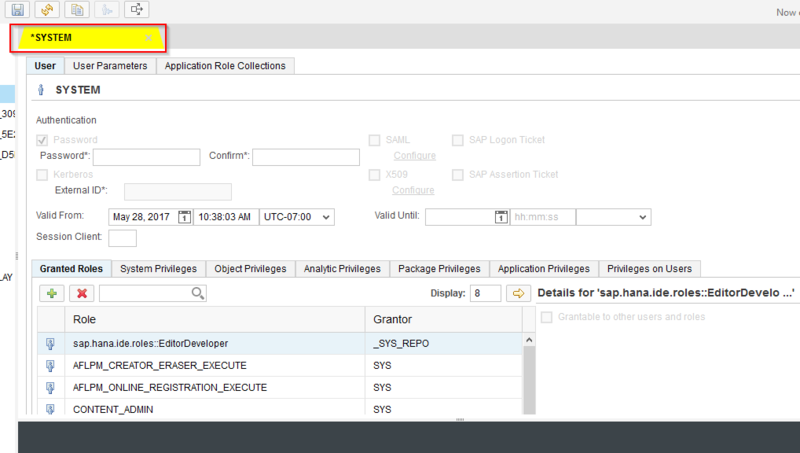 You can also access “CATALOG, EDITOR” FROM “TRACES” in SAP HANA WEB BASED DEVELOPMENT WORKBENCH. Right click on the highlighted icon.There you will find catalog and editor options. Thanks for taking the time to detail the experience, Deepthi! 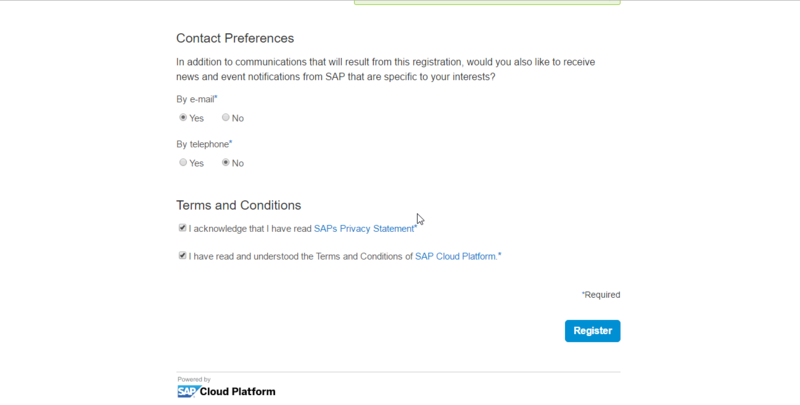 You could delete “HANA” from the first several steps since as you rightly note, we’re “SAP Cloud Platform” now. 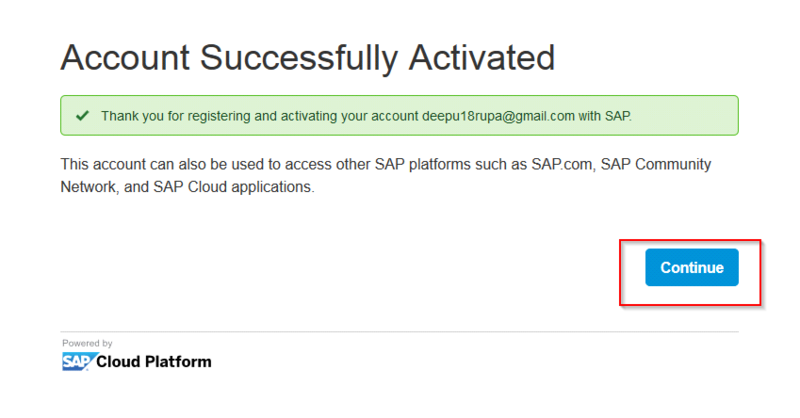 Looking forward to further contributions about what you’re doing with SAP Cloud Platform and HANA! Superb explanation for begginers thank you thank you so much..
Hope it will be useful for the beginners.Thank you. 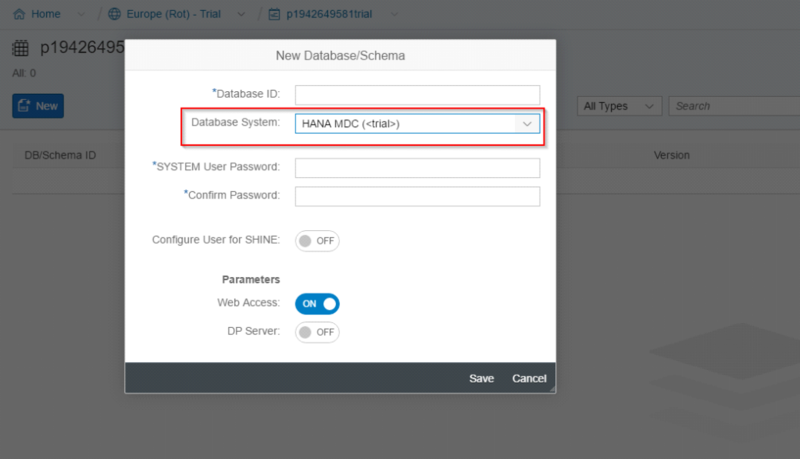 How can we use the HANA Tables data, and map it into our SAP UI5 project on WebIDE ? clear explanation for the beginners. Excellent. Keep up the good work. Thanks. Nice work!! Appreciate for your hard work. Thank you! at step 21, I am not able to login. it presents me a username and password screen. (instead of a message displayed in your blog) and I tried my trial account login and password and also tried the password I gave while creating the DB. I tried clicking on both the links below but they are not working. kindly help me how to proceed.